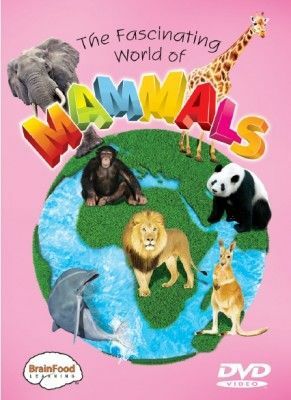 The kids and I recently had the opportunity to review The Fascinating World of Mammals, a DVD produced by BrainFood Learning, geared for kids ages 3-11 years old. The 52 minute long DVD introduces ten different mammals, starting with simple information, and then moving on to more in depth facts and vocabulary words. After each animal is discussed new words are reviewed for a few minutes. At the end of the DVD is a comprehensive review section, with the questions with simple questions in the beginning and more difficult ones as the review section progresses. The DVD is kid and family friendly, narrated in a knowledgeable, intelligent manner. While it certainly is interesting enough to hold a preschoolers attention it's most certainly geared toward older children as well. River (4), Kaden (10), and Adam (12) watched the DVD with me. We actually watched it twice (so far) because there was a lot of information presented. River liked the movie but lost interest when the review started (even though he knew the answers to the questions he stuck around for). I liked the movie because we got to learn about mammals. We learned about dolphins, beavers, bears, lions, kangaroos, elephants, and giraffes. We learned that mammals are the only animals with hair. We learned dolphins and bats use echolocation. The movie was very fun. I liked that it taught us about a lot of mammals, not just one mammal. I liked that it showed pictures of each animal. I think I can use what I learned in my whole life. I was impressed by the movie. I liked the detail covered about each mammal and I liked the review section at the end. I would absolutely take this movie on a road trip with us, knowing it would provide an hour of good, clean, educational, engaging entertainment. We were able to giggle together after the DVD ended about some of the cute animals and marvel at the ruminants (those are the animals with four chambered stomachs). The Fascinating World of Mammals is available for $14.99 at BrainFood Learning. DVD's about insects and birds are also available at the BrainFood Learning website.